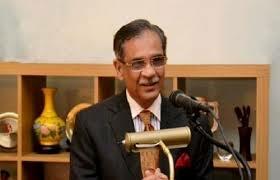 LAHORE: Chief Justice of Pakistan (CJP) Mian Saqib Nisar on Sunday lashed out at DIG Ghulam Mehmood Dogar for seeking undue favour from him through his son-in-law. The chief justice had summoned the police chief at top court’s Lahore Registry to explain why he had approached his family members. The CJP asked the police officer who advised him that he could seek undue favours from his family members. “How dare you approach my son-in-law to seek a favour from me? How dare you think that anyone can ask the chief justice of Pakistan for an undue favour? CJP remarked, adding that he is doing Jihad. Later, the chief justice then summoned his son-in-law Khalid Rehman to appear before the court and record his statement. Rehman told the court that the police chief, who is currently fighting a custody case for his children against his ex-wife, sought his favour pertaining to the case. “DIG Dogar wants the name of his ex-wife and children to stay in Exit Control List (ECL),” Rehman told the court. Subsequently, the DIG and son-in-law submitted an unconditional apology to the court. The CJP then ordered that further proceedings will be held in his chambers. Last year, DIG Dogar’s ex-wife, Mirjam Aberras Lahdeaho, had filed a petition in the Lahore High Court (LHC) seeking recovery of her sons from Dogar’s custody. Furthermore, the chief justice took notice of hefty salaries being paid to the doctors at the Pakistan Kidney and Liver Institute (PKLI). Taking notice, the CJP ordered the PKLI to submit details of all doctors and staff employed at the hospital along with records of their salaries. The chief justice also ordered the chief secretary to hand over a detailed staff structure of the hospital employees by evening. “It has come to the notice of the court that doctors were being hired at the hospital for salaries as high as Rs 1.5 million per month, the CJP said. He also demanded the details of the head of PKLI. The chief secretary who was present in the court at that time told the bench the head of the institution, Dr Saeed Akhter, is out of the country to perform Umrah. Last month, the PKLI came under criticism after comparisons were drawn between doctors who worked at government hospitals and at PKLI.